Jo Scheer has been deeply involved in working with bamboo for about two decades, having lived in Rincon, Puerto Rico, where he built a home for his family with mainly bamboo components. He has been designing, building, and marketing a wide range of beautiful bamboo creations that can be seen at his website tropical-treehouse.com, where you can also find rental information on various accommodations in this tropical paradise. Jo has recently authored a book, How to Build with Bamboo, that outlines some 30 bamboo projects that elegantly demonstrate the beauty and functionality of bamboo. One of the more inventive of his designs is what he calls a "hooch", which is a small elevated abode made almost entirely of bamboo. 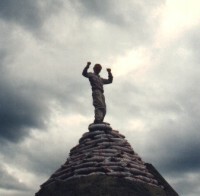 The grounded footprint of this inverted pyramidal structure is roughly one square foot, since the entire weight is born on a small pedestal, while the room above is stabilized with guy wires. This hooch has been featured on TV and at conferences. With a background in science, Jo has been a teacher, technician, inventor, builder, contractor, sailor, agriculturist and artist, and thus is eminently qualified to field your questions about building or living with bamboo. Q: Greetings from rainy and sunny Costa Rica. 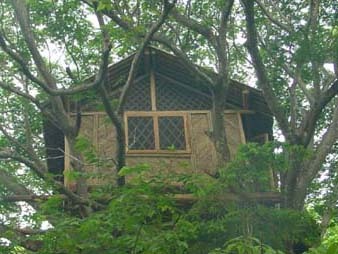 Very soon I am going to move into my new home---a treehouse built mainly with Bamboo. The roof is completely made of Bamboo and my concern is how to protect it from rain and sun. Do you have any advice? A: Nice work on doing the bamboo treehouse. I just build a bamboo treehouse in Costa Rica also- in Dominical. We used galvanized roofing- it works. An all bamboo roof? How did you do it? Spanish tile arrangement? I have used elastomeric roofing compound on my plywood roofs- works great. I have not used it for bamboo, or, spanish tile bamboo, but I think it would work. Waterproof, elastic, and re-coatable. Any pictures? You can see mine on my website (tropical-treehouse.com) check it out. Q: The architect who build my house is Martin Coto. He used bamboo poles, split them in half and placed the upper halfs above the meeting points of the lower halfs......well my English isn't that good, so I will take a few pictures and email them to you. This elastomeric stuff sounds to me like Sci-Fi and the words "waterproof", "elastic" and "re-coatable" strung a chord inside.......any idea how to get it down here in paradise? A: Martin is a master, no? Yes, the arrangement you describe is as I thought, spanish tile bamboo. I think the elastomeric would work very well. As for where it is available in C.R., I have not a clue. Pretty common in the big chain building stores, and chain paint stores. C: The normal progression with Bamboo is: First year it sleeps. Second year it feeds. Third year it LEAPS!. C: I saw a new "hardwood" floor made of bamboo in Calif a couple of years ago. It was beautiful, and was claimed to be harder and more durable than the usual hardwood flooring such as oak. I've since heard that many different building materials are being made from bamboo, including doors, door facings, cabinets, etc. There are two type of bamboo floors. The first type is the horizonal cut and leaves broad stripes with large joint marks. The second is the vertical cut which leaves a narrow grain. Both types can be blond, which is harder, or steamed which creates a darker color but is a little softer. We installed a vertical cut steamed version last year and really enjoy it. Easy to care for, and shows no sign of wear from the dog romping over it. Just make sure you get the 9/16 inch thick tongue and grove verson. Can be glued or nailed down. Q: There is an image of what looks like a log-style wall from bamboo. Is this a construction possibility? I've been inquiring about the feasibility of making a home in such a way for a while, and have generally been told that it cannot be done. A: I have not seen a design like that- horizontal bamboo, stacked, like a log cabin. This is my thought: Bamboo tends to crack with age. Exposed cracks will allow water into the culm, where it will stay- causing rot. However, if half culms were uses, the tendency to crack is much less. And, if it does leak, the water eventually drips off, and does not pool in cavities. Bamboo does flex, and move, so sealing the gaps between horizontal bamboos should use an equally flexible medium- elastomeric? Q: I am planning to make a large home in the Big Bend desert region of Texas. I plan to use Rammed Earth construction. I am thinking about growing bamboo (nigra henon probably) on my property. And harvesting and using this for the roof, this means that if any bamboo rots, I'll have a continuing supply at hand. I know that bamboo is specifically not supposed to be used for roofs, but I had a thought. I read about the "spanish tile" bamboo roof that you suggested using elastomeric roofing compound to waterproof. I was wondering, since this is going to be a rammed earth home and the look would fit, if I could simply cover the top of the split bamboo poles with several layers of thick plastic and then cover it with a light layer of dirt to both hold the plastic down, and cover it from sight. To me, this seems as if it would hold out all moisture from rotting the bamboo poles (since it will be the desert as well). If you see a problem with this idea, please let me know, as well as any suggestions that you might have. Like if whole poles as opposed to split "spanish tile" poles might be better. A: Interesting question, and an interesting concept. The Spanish tile bamboo arrangement is a good design, if fitted properly. Therein lies the rub - fiting bamboo is more than art - but doable. My problem was too shallow of a pitch, leaf debris tended to clog up the channels, then the rats started making nests..... So, a steep pitch at the very least. The finished interior (overlapping bamboo) looks not so bad. Less work, and less fitting, but still artsy, you could weave the bamboo into a rigid (or at least tight) roof framework. A gable roof would be easy, a hip roof - doable, a shed roof easiest. The interior, exposed surface wouldn't look so great- plastic bulging out of the sparse weave). The whole bamboo is a good alternative - no splitting, and a nice looking interior. With the earth roof, and the moderated interior climate, the bamboo should have a minimum of cracking. Good curing techniques would help a lot. Q: I am building a 45'x22.5' building and want to put a bamboo roof that will support straw bale for insulation. I am not worried about water since their will be a canopy covering the top. I am thinking that if I ran cable lengthwise, I could weave the bamboo over the 22 ft span. Do you think that would be strong enough to support the straw? Would that even work...I am open to any advice. A: Radical design. The cable and woven bamboo may be strong enough to support strawbale, but it would surely sag. But, if that is okay, then it might work. You will need to use good judgement on cable spacing and bamboo weaving. I think there are no structural tables that cover this design strategy. Q: I am building a home on an island in Thailand. I have been thinking of using Thatch or Bamboo for roofing. I like the spanish tile idea for bamboo, but the property does have termites. I recently toured the Greenschool Campus in Bali, where they immerse Bamboo in Boric Acid to make it insect resistant. I would appreciate any thoughts and insight into this. A: Treatment of bamboo with boric acid is an environmentally friendly way to preserve it. However, boric acid is water soluble, it must be protected from rain. Therefore, very inappropriate for roofing! Q: What kind of design can I put in the roof to have a long lasting (12 years life) and also have a bamboo roof. A: The "Spanish tile" bamboo roof, with offset split culms, works. However, make sure the culm nodes are removed effectively, and you have a steep enough slope- so the water runs off efficiently. Maintain the roof to prevents accumulation of debris and possible animal infestation. Q: I will be using the bamboo for a pergola roof and wanted to know best way of splitting the bamboo to make the roof. A: A big machete', or pole shave will split the bamboo nicely. Start the split on the fat end- after cutting to length. Also, knock out the nodes for water drainage. Make sure the final installation has enough slope for total drainage. Q: I have 10 bamboo huts in my property. In rainy season, how can I cover all those and with what so it can be saved from rain? A: Yes, bamboo will not last if exposed to rain. Tarps, either polypropylene or treated canvas, are the obvious, short term solution. Retro-fitting galvanized roofing is the best solution, with large overhangs. Painting the roof with Elastomeric roof coating is possible if done thoroughly. Q: We live in Ecuador and are about to construct two small round casitas. 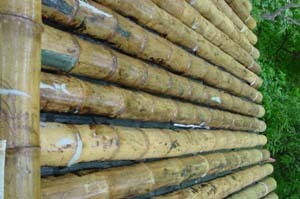 We have access to 7 meter long black bamboo (treated with boric acid) that we would like to incorporate into our roof. Thankfully, I read here that this bamboo would be water soluble. I now would like to use the bamboo as a replacement for wooden beam joists and install plywood on top of the bamboo and put tile on top of the plywood, which would protect the bamboo. The roof will have a slight slant for runoff. Do you have any idea how wide the spacing would have to be for the bamboo? The structure will have an inside diameter of 6 meters and an outside diameter of about 6.5 meters. A: I have used bamboo for roof joists, in a square and hexagonal roof design. I generally add horizontal purlins at 2' o.c., then screw galvanized roofing onto the purlins. I go as wide as 4' between the bamboo. Plywood adds to the cost, and must have additional purlins at the spacing of the rows of tile roofing. If this design gets heavy, I would beef up the bamboo spacing. Q: I am in Angola on a farm with a lot of bamboo varieties and wish to use them as much as possible to rehabilitate houses constructed by the ANC army during the war. Most of houses are missing the roof structure and roof cladding. Could I use the bamboo to make roofs including cladding, taking in account that you say bamboo has to be out of sun out of rain and the treatment will be washed? A: As long as the bamboo stays dry it will be fine. Care must be taken to prevent termites. Steep slope is needed for thatch roof; otherwise, tin is very effective.